Make the Most: Outline The Sky! I'm not always sure what this space is. This little blog space. My corner of the Internet. It's a place for memories, rambles, venting, travels, trials, errors, and as it changes and I question its existence every now and again, I've always told myself it can try to be anything and everything but one thing: even the slightest resemblance of a fashion blog. There will be no carefully curated outfits in front of Instagram-worthy walls. Nope! Not here! Partially because too many girls are already doing that right, more partially because I wore a sweater I sometimes wear to sleep to work today. But then a few weeks ago OutlineTheSky sent Brian and I some apparel we loved so much we wanted to show it off, so there we were on a Sunday afternoon. In front of a wall. 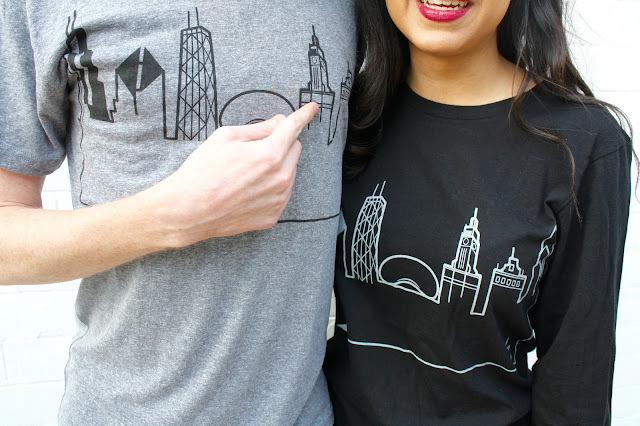 Acting as unnatural as one can humanly act, all in the name of our favorite Chicago tees. And while the photo above is an outtake, I can't bring myself to post the wall ones. Just know that we love this city, all of its walls, and like these shirts so much we don't mind walking around like two idiots in matching outfits on the chilliest of afternoons. OutlineTheSky is graciously giving readers 20% off with code MAKETHEMOST (offer ends 3/20/2016), and you're not limited to Chicago. There are dozens of cities to choose from. So get something! Grab your boo! Force them to a wall! Share your photos! It's really a shame you'll never see the wall pics. I was wearing fake eyelashes from an event earlier that morning. Yep.